McQuarrie, Jonathan. "Bombardier Inc.". The Canadian Encyclopedia, 12 November 2018, Historica Canada. https://www.thecanadianencyclopedia.ca/en/article/bombardier-inc. Accessed 20 April 2019. Bombardier Inc. is one of the world’s largest manufacturers of trains and commercial and private airplanes. Headquartered in Montreal, the company was originally incorporated as L’Auto-Neige Bombardier Limitée in 1942. Its founder, Joseph-Armand Bombardier, was a Québécois mechanical engineer who invented one of the first commercially viable snowmobiles. Bombardier Inc. has grown considerably from its beginnings as a snowmobile manufacturer and is now an iconic Canadian company, known for its public transportation vehicles and aircraft such as the C Series. 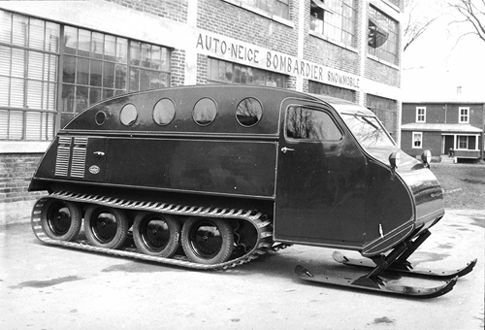 In 1936, Joseph-Armand Bombardier introduced his first commercial snowmobile, the B7 auto-neige. In the 1920s, an American inventor patented the term “snowmobile” after he devised tracks and skis that fit onto Ford Model T and Model A cars, converting them into early snowmobiles. However, these snowmobiles were heavy and slow. During the 1920s and beginning at age 15, Joseph-Armand Bombardier also began developing a car-based snowmobile design. His desire to create vehicles that could move easily in the snow was shaped by the fact that he lived in the small town of Valcourt, Quebec, where winter snowfall was heavy and roads were not systemically cleared. This rural isolation turned tragic when, in 1934, Bombardier’s son Yvon died after his appendix burst and the family was unable to reach a hospital. The event further motivated Bombardier to develop a vehicle that could travel through snow. 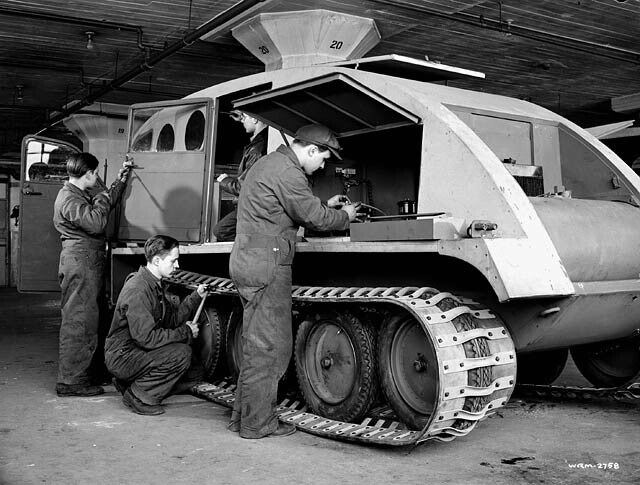 The body of a military snowmobile is assembled at the factory in Valcourt, Quebec, March 1943. By 1935, Bombardier had created a track system that turned with sprockets, or toothed wheels, which connected to and rotated the track. The sprocket, still on the Bombardier Recreational Products company logo today, enabled the creation of the seven passenger B7 auto-neige in 1936. Along with the more efficient sprocket and track system, the B7 had a lightweight cabin, a new rear suspension system and improved weight distribution. The B7 found customers among clergy, postmen, army officers and travelling doctors. Bombardier set up a new factory in his hometown in 1941 and the following year incorporated L’Auto-Neige Bombardier Limitée. Many of Bombardier’s family members were major shareholders in the new company. Family shaped Bombardier’s operations for much of its history. 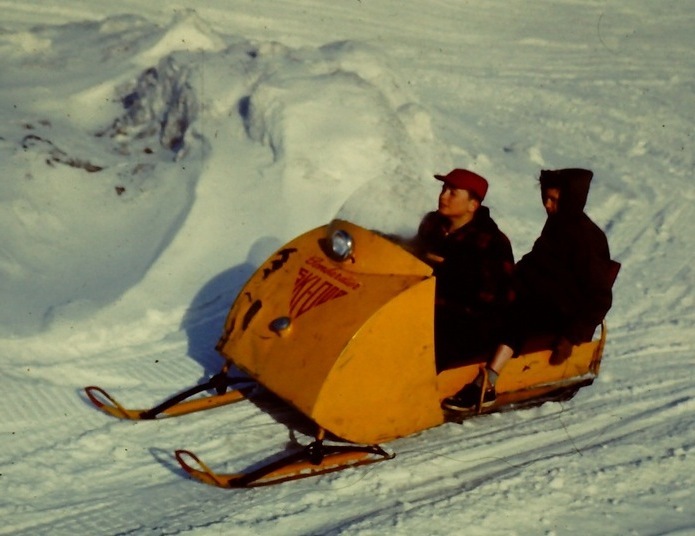 An early Ski-Doo model in Quebec, February 1962. In 1949, Quebec Premier Maurice Duplessis began a rural road clearing program, reducing demand for snowmobiles. To contend with this slump in sales, the company created the Muskeg tractor, an all-terrain vehicle that could be used at isolated forestry, mining and oil work sites. Further, Joseph-Armand Bombardier continued to refine his snowmobile models in order to create a smaller recreational snowmobile (seeSnowmobiling). He drew on advances in engine design, allowing for an engine small and powerful enough to drive a single or two-passenger vehicle he called the Ski-Doo. Launched in 1959, within four years Ski-Doo sales increased from 225 to 8,210, and the Valcourt factory expanded. After this success, Bombardier died of stomach cancer in 1964. 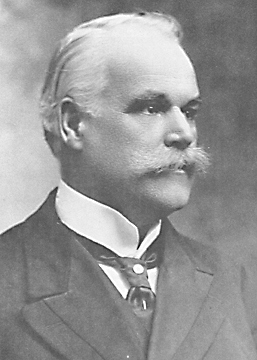 The firm’s presidency went to his son, Germain, who resigned within two years. Joseph-Armand’s son-in-law, Laurent Beaudoin, took over the company in 1966. Germain’s resignation was controversial. Beaudoin, who holds a Master of Commerce, contended that Germain lacked the managerial temperament or education required for the job, but rumours persisted that he pushed Germain out. Beaudoin remained the chief executive — almost uninterrupted — until 2008, and was instrumental in furthering the company’s diversification efforts. The firm changed its name to Bombardier Ltd. in 1967, reflecting Beaudoin’s ambition to expand the company beyond snow vehicles. Marketing and engine refinements to the Ski-Doo contributed to the company’s revenue growth between 1964 and 1972, from $10 million to $183 million. During this period, the firm purchased the Austrian tram building firm Lohnerwerke GmbH, in 1970. Lohnerwerke’s subsidiary, Rotax, made motors for Ski-Doos. However, in 1973, sales abruptly declined due to a spike in oil prices (seeCommodity Trading) and a series of winters with little snow. These challenges contributed to CEO Laurent Beaudoin’s desire to further diversify the company’s products. In 1974, with encouragement from Montreal mayor Jean Drapeau and train building expertise from its Lohnerwerke subsidiary, Bombardier won the contract for 423 Montreal Metro cars for the city, to be built at the recently purchased facility at La Pocatière, Quebec. To further increase its manufacturing capacity, Bombardier took over the Montreal-based locomotive manufacturer Montreal Locomotive Works (MLW) in 1975. The Quebec provincial government facilitated the purchase by providing Bombardier with financial assistance. With this deal, the role of state money grew in significance for Bombardier’s operations, a trend that would persist through all of its expansions. A strike by the Confédération des syndicats nationaux local at La Pocatière, lasting from 2 December 1975 to 20 April 1976, complicated the metro car contract. Workers protested limited wage increases during a period of major inflation, and expressed concerns about who the company was promoting on the shop floor. Delays led to Bombardier delivering only some of the cars in time for the 1976 Olympics. Meanwhile, poor management and labour trouble also beset the MLW plant in Montreal, including a lockout of 600 United Steelworker employees during the summer of 1977 and a six-month strike of 1,000 employees during 1979. Grand ambitions for the plant’s Light Rapid Comfortable (LRC) train cars, including a significant VIA Rail	purchase, were dashed by persistent mechanical issues, and Bombardier shuttered the entire plant in the mid-1980s. Orders from North American cities for public light rail and subway cars cushioned the losses from MLW. Following these successes, the company won a contract from the New York Metro Transit Authority for 825 subway cars in 1982. The order, valued at around $1 billion, was the largest single export sale by a Canadian manufacturer. It was facilitated by two things that were important parts of Bombardier’s operations: assistance from the Canadian government to help finance the deal, and use of another company’s expertise — in this case, Kawasaki Heavy Industries, a firm with personal transport, trains, shipbuilding, aerospace and other interests. The company also joined a trend of sending managers to Japan to learn about factory operations and managerial techniques. 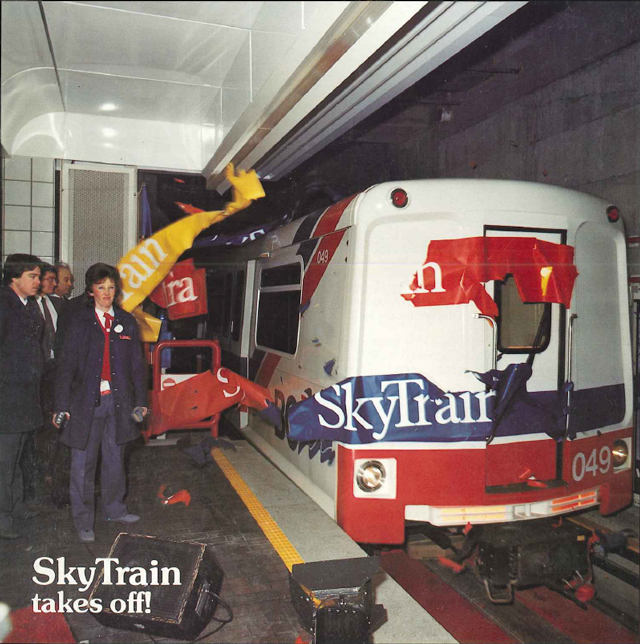 Vancouver's SkyTrain bursts through a banner on its first day in service, 11 December 1985. The success of the New York bid, which sparked orders from other North American cities, including cars for Vancouver’s SkyTrain, encouraged the company to expand its public transport capacity. The company identified Europe as a key market, given the importance of mass transit for most European countries. In 1986, Bombardier began to gradually absorb the Belgian railcar manufacturer BN Constructions Ferroviaires et Métalliques. The company continued to buy European rail firms, culminating in the $1.1-billion purchase of German-based Adtranz from DaimlerChrysler in 2001, making it one of the three largest train manufacturers in the world. A CF-18 fighter from 409 Tactical Fighter Squadron, CFB Baden-Soellingen, flies over southern Germany. In 1986, Prime Minister Brian Mulroney’s government sought to privatize the federally owned aerospace firm Canadair. 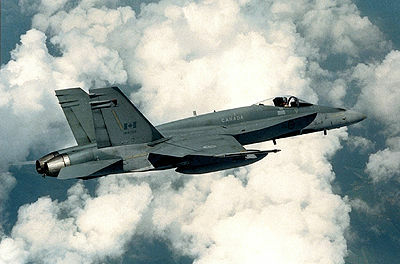 Bombardier initiated the purchase for four reasons: CEO Laurent Beaudoin’s constant interest in diversification, the relatively low purchase price (about $140 million), the prospect of owning and developing Canadair’s well-regarded Challenger jets, and the opportunity to use its new aeronautic expertise to secure contracts for maintaining Canada’s CF-18 fighter jets (see Military Aviation). When the Mulroney government awarded Bombardier the CF-18 contract over the bid of the Winnipeg-based subsidiary of Bristol Aerospace, long-held western suspicions of federal preference for eastern industrial development over western interests re-emerged. For years, the Reform Party and Canadian Alliance, both with considerable power in the West, would claim that Bombardier was a beneficiary of corporate welfare and federal favouritism for Quebec. Following the Canadair purchase, Bombardier continued looking for value in struggling aerospace companies. In the United Kingdom, Prime Minister Margaret Thatcher’s government sought to privatize the Northern Ireland aerospace company Shorts in 1989, and Bombardier moved quickly to bid, offering $60 million. The company sought to acquire some of Shorts’ regional jet expertise (i.e., small, short-haul aircraft) and was encouraged by British government assurances that they would help fund the modernization of the plant, among other benefits. 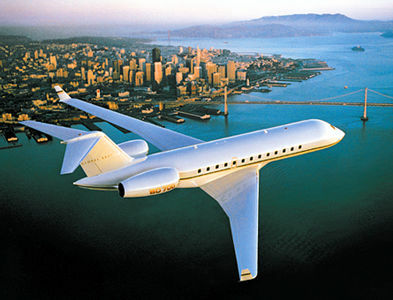 Bombardier's new business jet was launched in September 1996. Along with entering the commercial and military aerospace markets, Bombardier expanded into the private jet market with its 1990 purchase of Kansas-based Learjet for $75 million. Keeping with its tendency to accumulate other companies’ expertise, Bombardier kept much of Learjet intact, making only moderate adjustments to the firm’s managerial practices. In 1992, Bombardier acquired aircraft manufacturer de Havilland Canada from another aircraft company, Boeing. De Havilland was particularly known for its Dash 8 commuter airplanes, complementing Bombardier’s regional jet production. Government contributions, including a 49 per cent equity stake in the firm purchased by the Ontario government, further facilitated the deal. By 1997, Bombardier transformed these government-supported purchases into about a 50 per cent share of the global regional jet market. Following Bombardier’s significant expansion, CEO Laurent Beaudoin strained to manage the massive company. Under the direction of his executive vice president, Dr. Yvan Allaire, the firm restructured the management of its five operating groups in 1996 — aerospace, rail transportation, recreational products, international markets and financial services — each one getting its own president and chief operating officer. 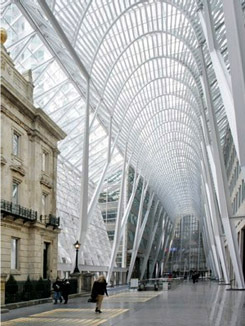 The relatively small Montreal headquarters, with about 150 employees, oversaw the five groups, but each unit was given considerable independence for making operational decisions. Originally, the financial services arm of the company, Bombardier Capital, primarily concerned itself with arranging financing for snowmobile dealers. Inspired by how General Electric’s financial services unit, GE Capital, had expanded into financing a wide range of activities, Vice President Yvan Allaire led Bombardier Capital’s expansion into ventures unrelated to its core transportation businesses. These ventures included offering mortgages for high-risk, prefabricated home development, concentrated in Texas and South Carolina. 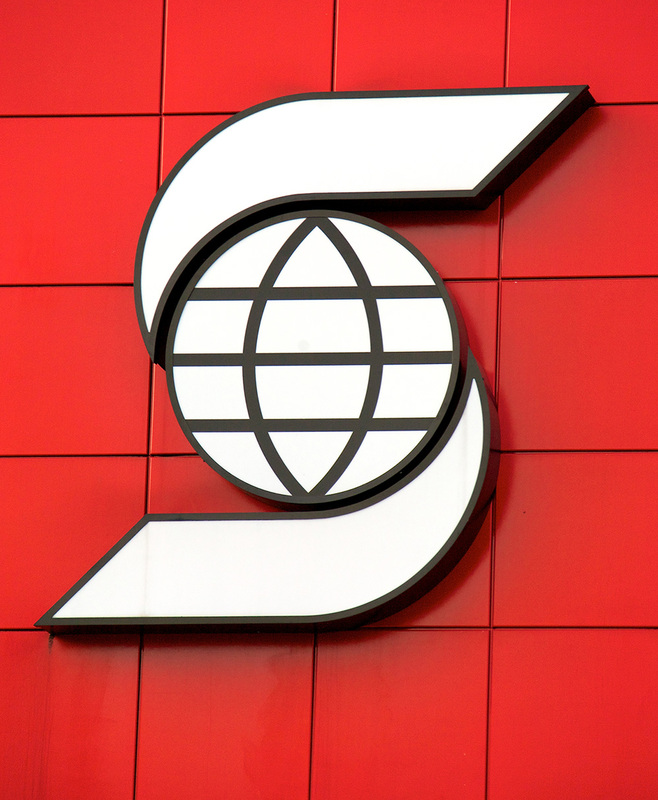 However, this expansion failed, as many people who took on these mortgages were unable to pay their loans and investors found Bombardier’s mortgage business increasingly unappealing. Following this episode, by 2001 Bombardier had largely withdrawn from the mortgage market, having lost $663 million in company value. Following the 2001 purchase of German train manufacturer Adtranz, Bombardier Transportation discovered they had underestimated the company’s costs and overestimated its assets, leading to a dispute between Bombardier and Adtranz’s parent company, DaimlerChrysler. During the purchase negotiations, DaimlerChrysler had refused to allow Bombardier to directly contact Adtranz’s management, since the two firms were still in direct competition, but Bombardier went through with the purchase anyway. In 2004, the two firms agreed to shave about $300 million from Bombardier’s original $1.1-billion purchase. At the same time, Bombardier Aerospace struggled with stiff competition from the Brazilian company Embraer, and from a decline in the overall market following the 11 September 2001 attacks by the terrorist group al Qaeda in the United States (see 9/11 and Canada). The company found itself in considerable trouble after two decades of rapid growth. Paul Tellier, the former Clerk of the Privy Council Office and CEO of Canadian National Railway, became CEO of Bombardier in January 2003. He undertook an aggressive program of downsizing, eliminating 3,000 aerospace jobs in Canada and Northern Ireland, 6,500 rail jobs in Europe, and closing down Bombardier Capital. Seeking to improve the company cash flow, Tellier also decided to sell off the products that started the company. After considerable debate, he sold the recreational vehicle division in 2003, including the iconic Ski-Doo snowmobiles and popular Sea-Doo watercrafts. The Bombardier/Beaudoin family decided to purchase a 35 per cent stake in the new Bombardier Recreational Products company, which sold for nearly $1 billion. The firm is based in Valcourt. Having made those controversial decisions, Paul Tellier left the CEO post in December 2004, and Laurent Beaudoin retook the position, eventually passing it to his son Pierre in 2008. In 2015, leadership transferred again, this time to Alain Bellemare — former executive at American aerospace and defence company UTC Propulsion and Aerospace, and only the second non-family member to run Bombardier. Under Bellemare’s direction, the company continues to focus on aerospace and transportation, albeit with significant challenges. Bombardier continues to service national railways, including a major sale of 660 cars for a British rail operator in August 2016, as well as regional and municipal public transportation, including significant contracts with Ontario’s Metrolinx and the Toronto Transit Commission (TTC). The Metrolinx and TTC contracts — for light rail vehicles and streetcars throughout the Greater Toronto Area — have tested Bombardier’s reputation, as several delivery deadlines have been missed. In 2016, the company’s woes were also reflected in a series of layoff announcements, beginning with 7,000 job cuts announced in February followed by another 7,500 announced in October. In November 2018, a consortium of Bombardier and French train manufacturer Alstom received a $447.7-million contract to build 153 train cars for the Montreal Metro. The deal was crucial to the survival of Bombardier’s plant in La Pocatière, Quebec, where nearly 170 of its employees will build the AZUR-model cars. Bombardier has also faced challenges on the aerospace side of its business. Its C Series line of passenger aircraft, hailed for being larger and more efficient than other aircraft on the market, was plagued by higher-than-expected costs and delivery delays. In an effort to support the ailing project, the Quebec government gave Bombardier $1 billion in financing in 2015. While the company originally planned to deliver customers 15 aircraft in 2016, only one plane had been delivered by June. By September, the company announced it would only meet about half its 2016 delivery goals. In September 2017, the C Series jetliner became the subject of international trade disputes. The United States levied a 219 per cent duty on C Series imports	after American company Boeing complained to the US Department of Commerce that Bombardier had sold the planes to Delta Air Lines at an unfair advantage because Bombardier received government subsidies for the C Series. Meanwhile, the World Trade Organization	announced it would establish a panel to investigate allegations filed by Brazilian company Embraer that Bombardier’s C Series program received unfair advantage from its government subsidies. The following month, Airbus, a multinational aerospace corporation, bought a majority stake in the C Series program. In the deal, an Airbus plant in Mobile, Alabama, was repurposed for C Series assembly, which circumvented the large duty levied in September. Program headquarters remained in Montreal and Airbus was given the opportunity to buy the remaining stake in the program from Bombardier and the Quebec government. Bombardier continued to sell assets outside its core business as a manufacturer of private jets and rail technology. In November 2018, it announced the sale of its Q Series turboprop passenger aircraft program to Viking Air of Sidney, British Columbia. The US$300-million deal also gave Viking Air the rights to the de Havilland	name and trademark, which Bombardier had owned since 1992. Bombardier simultaneously announced the sale of its business aircraft training activities to Montreal-based flight training company CAE	for US$645 million. Finally, Bombardier revealed it would lay off 5,000 employees: 2,500 in Quebec, 500 in Ontario and 2,000 outside Canada. These job cuts amount to more than 7 per cent of the company’s workforce. JOSEPH-ARMAND BOMBARDIERWatch the Heritage Minute about Joseph-Armand Bombardier from Historica Canada. See also related online learning resources. ARMAND BOMBARDIERA profile of Armand Bombardier from the Canadian Science and Engineering Hall of Fame. BOMBARDIERThe official website for Bombardier, a world-leading Canadian manufacturer of innovative transportation systems, from regional aircraft and business jets to rail transportation equipment. Click on "About Us" and then "History" for an interactive timeline depicting company history.